Elegantly Eastern Stampin Up! Challange. From time to time, we are challenged by our upline Sam of Pootles Papercraft. Heaven forbid we sit and do nothing! This is my entry. I have been having a play at making a tri-fold card decorated with Stampin Up! 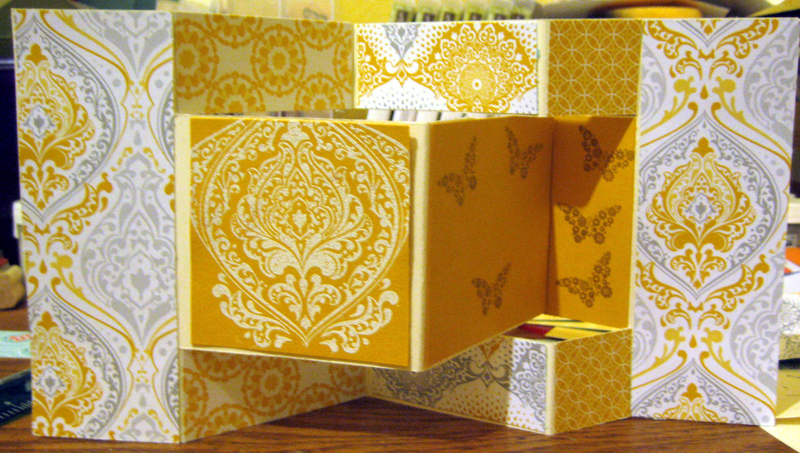 Eastern Elegance designer series paper, the Beautifully Baroque stamp and one of the Papillon Potpourri butterflies. The only difficult bit is working out the dimensions for scoring. You need to have two sections which are the same length, or your card will not fold properly. Don’t forget that you need to write on one of them, in this case the section stamped with butterflies so leave space, other than that decorate to your heart’s content. To make the card I used. Eastern Elegance Designer Series Paper. If you have any questions, please feel free to contact me, and if you would like to order any of the “ingredients” I am happy to do that for you or click on the link on the left to go to the on-line shop.